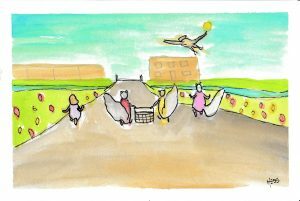 We know that when creative potential is unleashed, it creates positive change in all aspects of community life. 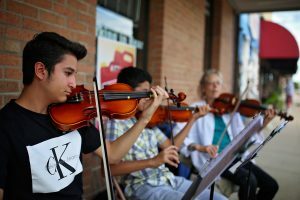 Put another way, when the arts thrive, communities thrive! We’re committed to integrating creativity into all aspects of community life by bringing leadership and energy to the Reedsburg Area's growing arts sector. 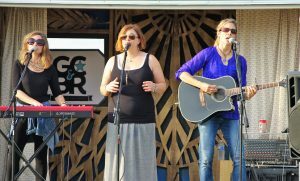 2018 was another year of hard work for Reedsburg ArtsLink with many positive creative outcomes-- some planned, and some unexpected! Some magic happened in our community in 2018 that wouldn’t have been possible without the support of generous arts advocates like you, who believe in the power of creativity to build community. Please check out some of ArtsLink’s 2018 highlights in the photos below--and consider a tax-deductible donation to help us continue our work of advancing a culture of creativity in our community in 2019 and beyond. Again, thank you for your ongoing support! Installed large scale participatory public art in City Park with the help of over 200 area youth and adults. 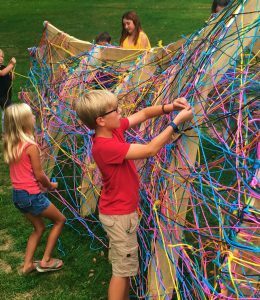 Pictured: young artists weave colored twine to complete The Reedikulus Polychrome Walleye in City Park. 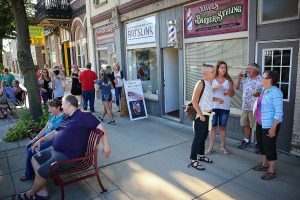 Hosted our 4th Reedikulus Arts Crawl in Reedsburg's downtown. Pictured Top: Linda Meadowcroft & students. 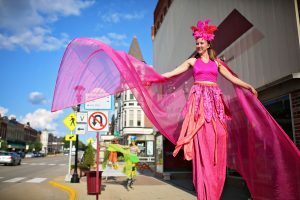 Above: Wild Rumpus Stilts Walker on Main St. 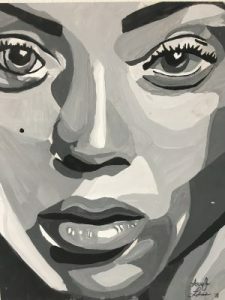 Exhibited the work of roughly 30 Reedsburg Area High School Students during Fall and Spring Art Shows. Pictured: Self portrait by RAHS Senior Anna Jo Lubasi. Launched the 20 Poems Project which included this poetry Workshop for English Students at RAHS. Pictured: Madison-based poet Katrin Talbot works with Ms. Carey's students to create an original poem as a group. Created an Artist's Show & Tell program providing local artists, performers, and musicians a forum to share new work and creative ideas. Pictured above: Illustration by Josh Hess. 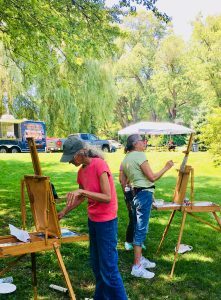 Partnered with Edgewood College for Second Sundays at The Painted Forest. Pictured: Plein Air Artists at work. 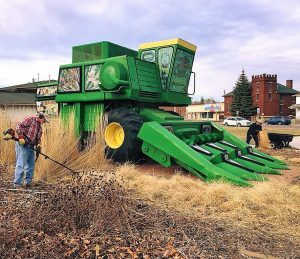 Maintained the iconic Ruminant in Harvest Park and continued to raise funds to complete the park with additional landscaping. Pictured: Jan and Carolyne Aslaksen help with Spring Clean up 2018. Hosted our first major event in Harvest Park—a free concert featuring the band Gin, Chocolate and Bottle Rockets! Our Main Street office in Reedsburg continues to grow as an incubator for creative people and ideas!